Lymph Drainage. It sounds like some kind of plumbing technique and, well, it sort of is. It’s a specialized system inside your body draining out non essential and sometimes harmful invaders. The lymphatic system deals with managing fluids inside the body. It works with the circulatory system and the immune system. 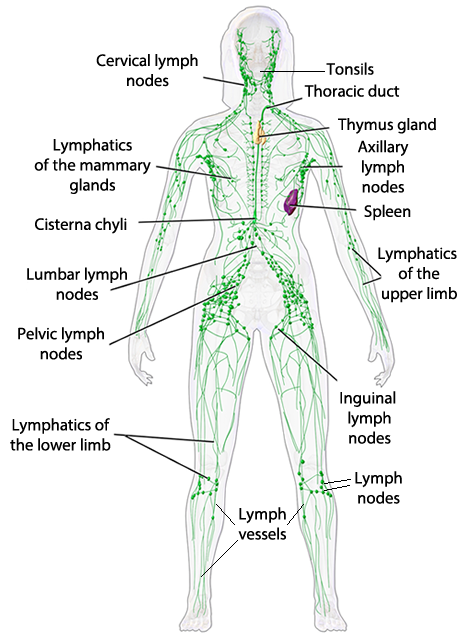 This system is comprised of a vast network of vessels carrying lymphatic fluid and of lymph nodes, the spleen (basically a big lymph node that also produces fighter cells), the thymus gland (fighter cell production) and tonsils. Lymphatic fluid is the left over fluid, or a watery substance, from plasma (blood) that goes deep into the body from our blood vessels as the blood is pumped out through tiny capillaries bringing fighter cells to every other cell in our body. Lymphatic fluid contains our defense cells which assist the body to locate and fight pathological abnormalities and invaders who cause infection and disease. As this fluid moves in between the layers of tissues inside the body, it is pulled into the lymphatic vessels and is filtered by the lymph nodes. Once at the nodes, the fluid can leave behind any invaders or toxins to be disassembled and destroyed. Once the fluid passes through the nodes and is rid of its contagions it then returns back into the blood circulation. Okay but what does it look like when I get a Lymph Drainage treatment? There is more than one way to perform lymph drainage. Dr. Emil Vodder and his wife Dr. Estrid Vodder were leaders in Manual Lymph Drainage (MLD). The technique taught at this school is performed on dry skin, sometimes with a light powder such as cornstarch. This keeps the pressure light, targeting the lymphatic system. The technique is performed to treat a specific area – this is not designed for a full body flush. There are similar methods to MLD that are taught in massage therapy schools for local area problems such as a swollen ankle or contusion (bruise). For a fast general sweep of the whole body I personally prefer to use enough oil on the skin which helps to keep the pressure more superficial rather than focusing on the deeper structures like muscles, tendons, etc… It is a fast sweeping massage but very light in pressure. In a pinch lymphatic drainage could possibly be performed through clothing but the efficacy will not be as good. This is acceptable for emergencies but not a preferred option. With every style of lymphatic drainage the same rules apply: opening the areas of drainage and working with the watersheds towards the nodes with the intention to drain the fluid through the nodes and back to the general blood circulation. This type of bodywork is good for a clean up or general lymphatic flush. It is a general sweeping full body massage working with subclavian vein activation and lymph node pumping while following the watersheds in the body. This type of work is good for a general, full body flush. This work concentrates on a specific area that may have sustained an injury and has some swelling such as a sprained ankle. The therapist will work by pumping the subclavian veins and the local nodes and then perform specific lymph drainage techniques in the local area of the swelling. This does not include a full body flush unless that was indicated from the time of booking and the therapist and patient agreed that was the best approach for the session. This type of work is good for a minor to moderate injury. The Vodder method is a gentle technique that feels like soft pumps and stretches on the skin addressing the lymphatic vessels which will facilitate drainage by drawing fluid away from the tissue. Encouraging lymph to flow faster will enhance injury recovery of all types. What if I have a systemic issue such as lymphedema or swelling from a recent surgery? For serious cases of advanced lymphedema (stage III) Combined Decongestive Therapy (CDT) would be recommended which is the Vodder style MLD and compression garments. You would likely need consistent treatments and therefore would be better off to go to a clinic where this is their specialization. You should be able to have therapy everyday or as consistently as needed. There are a number of practitioners in the city who do this kind of work and I recommend contacting the external resources below to find out more information. Post surgery would be a case for Toronto Bodyworks’ therapist Nicole Dahl RMT who has completed the highest level of training in Vodder MLD work. When would it be okay to book in at Toronto Bodyworks for a lymph drainage session? If you have a minor to moderate injury (such as a sprained ankle) that is going to heal on it’s own without surgery or other major intervention then we have some therapists who can help with a local lymph drainage treatment. Perhaps you are looking for a general sweep to flush your system. Maybe you feel your fluids are not moving optimally, you are fatigued after recovering from a nasty cold or just feeling plain sluggish. In that case try the general flush lymph drainage session with us. For mild to moderate lymphedema and post surgery conditions Nicole can help patients manage their lymphatic issues including but not limited to: primary and secondary lymphedema, venous insufficiency, post-masectomy lymphedema, plastic surgery, scar tissue, burns and more. All therapists listed under Lymphatic Drainage can address other more minor issues such as inflammation from sprains and strains, sports injuries, pre-operative procedures, arthritis, migraines, constipation, sinusitis, whiplash, dermatological conditions, and possibly more. No matter where you choose to go, once the flow of lymph fluid in your body has been disrupted you need proper care by someone who understands how to work with the watershed routes in your body to ensure proper fluid direction facilitation. If the disruption has been greatly impacted you may need someone with more advanced training who understands how to work around the body’s watersheds to ensure proper drainage. Nicole is currently the therapist to see at Toronto Bodyworks for more serious conditions as noted above. There is no one best place to go, you must find a therapist that works for you. If you decide that Toronto Bodyworks would be suitable for your lymph drainage needs be sure to disclose your preference for which type of lymph drainage you are considering and if appropriate why you prefer this style at the time of booking so that we can match you with a suitable therapist.